Chad was working 2 jobs and the money he was making just wasn't cutting it. He'd always wanted to be a truck driver, but the timing just hadn't been right. After the Navy, he got married and started a family always thinking that eventually he'd give trucking a try. Q: What were you doing prior to trucking? A: Pharmacy Technician at Wal-Mart, also taught Pharmacy Tech. prerequisite classes at a local community college. Q: What made you decide to become a trucker? A: The money was so-so with my 2 jobs, but I’ve always wanted to be a trucker. I was in the Navy when I was younger, and when I got out I got married and started a family, life just kind of happened. When I turned 40 and hit a little mid-life crisis, I finally decided I had to go after it. Q: How was your training experience? Anything that really stuck out? A: I had previously started with a different company to train, but when I left and decided to go through Driver Solutions, it was a night and day kind of difference. I went to C1 Fort Worth, and I could tell almost immediately that the instructors were really focused in on you. C1 was also really well structured, whereas the company I previously went to get my CDL with was kind of all over the place. Q: What’s your favorite part about truck driving? A: The freedom of it. You’re accountable for doing your job, but somebody isn’t always watching over your shoulder. You’re your own boss. Q: You made the decision to get your HazMat endorsement ASAP, why? A: I knew having a HazMat on my CDL would mean me making more money on every single load - HazMat or not. I didn't want to wait around. As soon as I graduated from school I started the process, studied, did the fingerprints, testing and all that good stuff. By the time I was done with training with my Mentor and ready to go back home, I had my HazMat endorsement waiting on me. The difference in pay when you have a HazMat is extremely noticeable...especially running as a team. Why wouldn't I want to start earning more money as soon as I could? It just makes sense. Q: Why do you think some people delay on the HazMat? A: I think a lot of drivers have a misunderstanding on what hauling HazMat means. They think it's like your driving around with a bomb in your truck and it's not. For example, my last HazMat run was hauling plastic beads. It varies from person to person, but I haven't really had to haul a whole lot of HazMat loads and I'm getting paid HazMat for each load regardless. I think that's what people need to understand. Q: You're on your way to becoming a Driver Mentor. What made you want to do that? A: I've always enjoyed helping people and want to see others succeed. And it doesn't hurt that it's a great way to make more money, too. It's rewarding for me to know that I had a part in helping to make someone a safe, processional driver. I know that if I stick with this, I can earn some great money and really make a difference. This is the next step for me and my career. 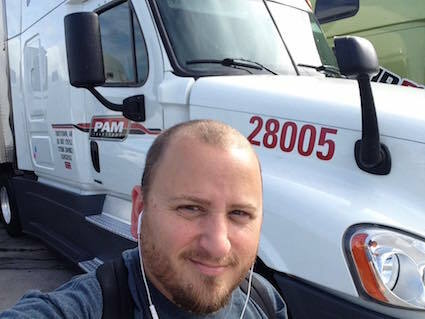 Q: How’s your overall experience been with PAM Transport? A: It’s been good. The first 3-6 months are the toughest, with adjusting to a new lifestyle while dealing with being away from home. But I stay busy, I really don’t sit much. I've also been able to take advantage of some opportunities to make more money pretty quickly, so that's been good as well. Q: How’s your relationship with your dispatcher? How important is it to maintain a good relationship? A: I have a great relationship with my dispatcher. I always tell new drivers that I meet either in person or on Driver Solutions’ Students and Alumni group that as soon as they get the chance, introduce yourself to your dispatcher. It puts a face with your name and truck number, and helps to build a real relationship. Q: Favorite part about the company? A: I really like that our freight is generally dry-van, no touch, and drop and hook. There’s usually a quick turnaround because of this, whereas with other types of freight I could get caught waiting for hours. Q: Coolest place PAM has taken you? A: Drove through the mountains of California on I-40. 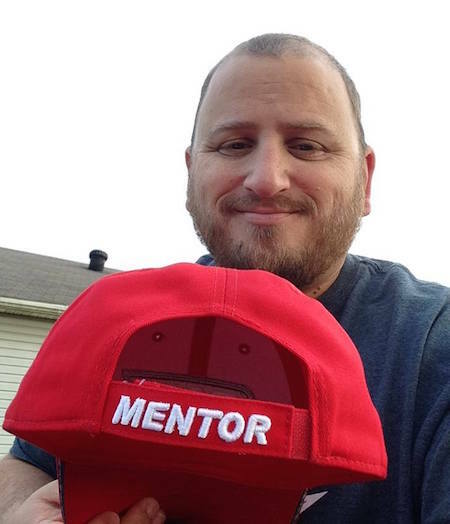 Glenn is also a Mentor at PAM Transport who took a break from his busy schedule to tell us all about his journey so far.